BMW E36 has a built-in test to know the status of the main systems of the car. There you can see the actual mileage of the car or reload the software. Of course, bmw 3 series dashboard interface is not very convenient, and useful information in this test is not much, but its useful to know. Suitable for E36 1992-1999, sedan/coupe/touring/M3. Step 1. Press and hold the reset button daily run (RK). Step 2. Turn the ignition key (IK) to position #1.
the Display will show something like "tESt 01"
Combination 2. CODE NUMBER (5 digits) – internal code. Combination 5. The version of the software. To end the test turn off the ignition or translate IK to position No. 2. 1995 - 1998 (99) 318ti, Z3, 1997 - 1999 E36 sedan/coupe/touring/M3. Tests 1-4 are unlocked and available. Tests 5-14 are locked and require unlocking the test mode. Tests 2-14 can be caused when unlocked the test mode at any time, even while driving. Test 15 is a function lock/unlock. Step 1. Press and hold the reset button for trip odometer (RK). Step 2. Turn the ignition key (IK) to position No. 1. Test 3. The remaining distance to the end of the current service interval, the remainder of the kilometres driven since the last reset - concerns OIL SERVICE or INSPECTION. 4 Test. The remainder of the term up to the end of the current service interval (for the "Americans" a value is missing). Refers to the European annual (checkup). 5. Test Evaluation factor service interval – contains data exceeding the maximum engine speed (triggering the Rev limiter) or exceeding the maximum operating temperature of the engine (overheating engine). t1 – overloadthe roar was. Test 6. Fuel level and coolant temperature. 16 shows the hexadecimal code of the measurement readings. Test 7. 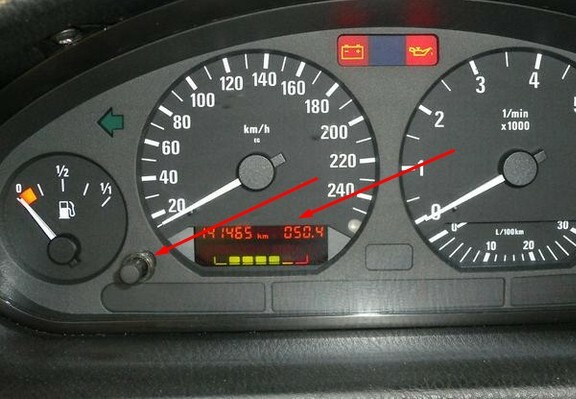 Engine speed (digital tachometer) – shows the current value of rotation. Test 8. Speed – shows current speed. Test 9. Mileage – this test allows to change the total mileage in case you need to replace a component storing odometer. The test is performed in case of detection of change odometer on the dashboard. The test indicates which component stores the minimum value of the run. for Example: 012654 means that the mileage stored in the internal EEPROM less mileage in code block. Press on RK 4 second will overwrite (replace) lower mileage of big and small difference will cancel odometer. At the same time given evidence of the service interval. Test 10. The values of the input signals on the instrument panel: 0 – no signal 1 – signal (the display of the odometer – 6 digits left to right). 1.The contact of the belt (0 when buttoned belt). 2.Contact; ignition lock (0 with the key in the lock). 3.End of the door (0 if door is open). 4.Clock button (or the odometer?) pressed – reading 0. 5.Reset service interval (0 at reset). 6.Error in transmission (transfer?) ESG (0 on error). Test 11. the Values of the output signals on the instrument panel: 0 – no signal 1 – signal (the display of the odometer – 6 digits left to right). 2.Warning light the brake system. 3.The signal lamp on the small remainder of 4.fuel. Test 13. Country code – displays the country for which this version is the dashboard cannot be changed. Reading USA 02. Test 14. Reset (reboot) the software – in particular, it is likely in the case of errors after replacing components. After a reset, the system will exit the test mode and the test will return to locked mode. Attention: Try not to view the readings of engine rpm and speed (using the test of course) on the go - numbers are small, hard to see, and then still have time to smoke, drink beer, eat sunflower seeds, talk on the phone and drive, etc.